Something for young players and parents to help them keep in touch with everything happening with Junior Cricket teams and coaching at Park Drive. Accessible on Mobiles, tablets and PCs. I am hoping parents, young players etc. 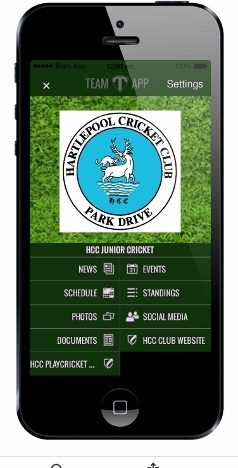 will take advantage of a new APP which is being developed specifically for HCC junior Cricket. Its aim is to help improve communication with parents who have children currently playing cricket or attending coaching at the club. The HCC Junior Cricket App is FREE and people who download the App and sign up will be able to tailor the content to their individual needs. e.g. if your child currently plays in under 11s you may only what to receive updates linked to that group. As they move up each year you just request a change to the group they currently attend. The club and coaches/team manager will help update the content with news and events to help keep everybody informed about what is happening. Some news content is public, other content and messages may only be visible to the relevant group. It is early days but as we develop this app it is hoped it will become a valuable communication tool and helps take the Junior Cricket forward. Apologies if you have already been in touch and signed up. The Junior Cricket has an excellent support from parents and we can only get stronger. Regards and may the sun shine on Fridays!